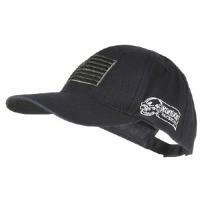 Upgrade your personal appearance with the US Flag/Logo Cap from Voodoo Tactical. Whether spending the weekend in the woods, working in the yard, going on a jog or running into battle, Voodoo Tactical's caps are sure to make a difference. The one size fits all design secures to heads of all sizes for all day, comfortable wear. The reinforced brim utilizes shade technology to keep the sun off the brow and protect the face from the sun's damaging rays. As if that was not enough, the cap comes embroidered with the American flag, so wearers can proudly display their patriotism for all to see.